A couple of weeks ago Blogger Robert alai shared pictures of his car windows smashed by what he believes was a plot to take him out. The blogger has now come out to claim that Nairobi County Governor Evans Kidero was the one who sent the thugs and that he is currently sending threatening SMS's to him. 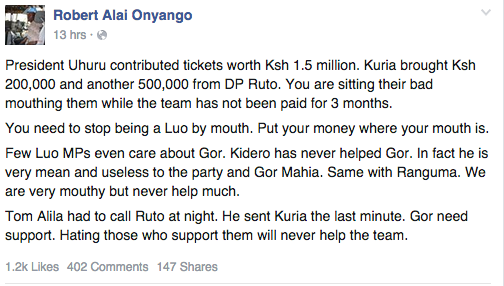 According to Robert Alai, the reason is because he criticized him for turning a blind eye on Gor Mahia. 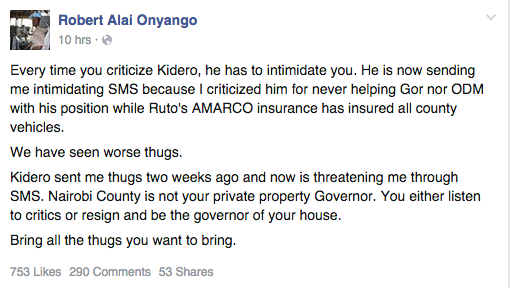 Every time you criticize Kidero, he has to intimidate you. He is now sending me intimidating SMS because I criticized him for never helping Gor nor ODM with his position while Ruto's AMARCO insurance has insured all county vehicles. We have seen worse thugs. Kidero sent me thugs two weeks ago and now is threatening me through SMS. Nairobi County is not your private property Governor. You either listen to critics or resign and be the governor of your house. Bring all the thugs you want to bring.